The 2017 Rocky Mountain Audio Fest in Denver was due to start in a couple of hours. Audio fans were already queueing up at the door waiting to wade into the annual milieu of many of the audio world’s top companies. For us media types there was an early treat in store. Focal, the French speaker giant was about to unveil the first product in a new line of speakers called the Kanta N°2 in the main floor Cottonwood room. As we filled the room there were a number of fabric covered floor standing speakers waiting to be discovered. At the appointed hour, the Focal team pulled the literal cover off the new Kanta N°2’s and we all got our first look at the newest member of the Focal family. The first to combine their flax driver technology with their Beryllium tweeter. The Kanta line occupies a place below the Sopra, which is currently held by the Electra series. Coming in at a height of 112cm and weighing in at 35kg, the Kanta N°2’s have a fairly compact floorstanding footprint. Focal has brought in the full breadth of design options for its new three-way offering. Four high-gloss front panel colour options with a high-gloss black rear shell including Carrara White, Gauloise Blue, Black Lacquer, and Solar Yellow. There are also four matt colour options including Ivory, Warm Taupe, Gauloise Blue and Dark Grey, with a Walnut wood finish shell. All colours complimented the subtle tan/white shades of the flax drivers. Magnetic grilles are included but not required for best sound. The overall aesthetic was very refined and struck a great pose. The Solar Yellow was by far the most visually striking making the other colour options more laid back and less likely to dominate the eye in a living room space. 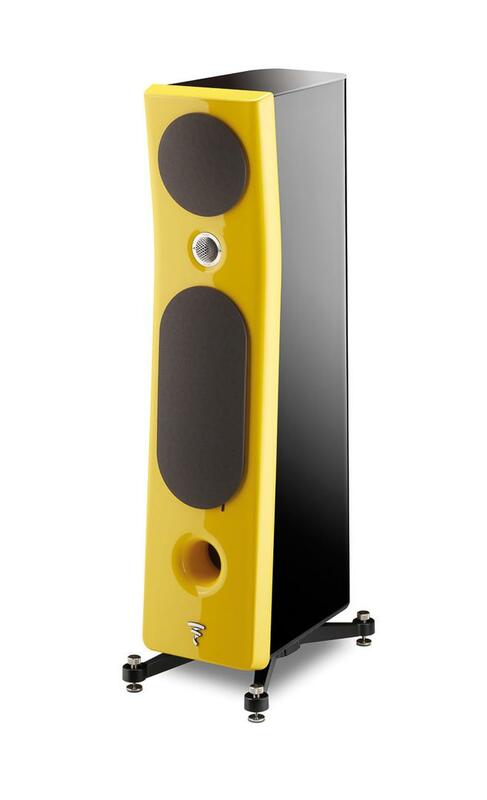 Clearly Focal was seeking to have the Kanta N°2’s integrate successfully with a wide number of interior décors. Taking some time with the pair closest to me in bright Solar Yellow, I was struck by the modern style of the Kanta N°2’s. First there is a clear family resemblance to the higher end lines. The bend near the top to facilitate the Focal Focus Time alignment while not adjustable like the Utopia line was similar to the Sopra’s. The new IAL3 tweeter is similar to the Sopra’s IAL2 utilising the same principles of infinite acoustic loading and infinite horn loading that, according to Focal research, “helps with the absorption of waves, thus lowering the tweeter resonant frequency.” Focal’s stated goal is to reduce distortion in every register and their continuing research toward this end has, in their view, moved one more step forward with the new IAL3 tweeter.